Hemlock is a record label deeply synonymous with the strand of club music which began splintering off from dubstep in the latter half of the last decade. This shift sparked a movement which soon saw tempos declining and the music of that period fusing with elements of techno, while retaining the bass frequencies which were so integral to the sound. Following in the wake of Hessle Audio, whose inaugural release came just a year earlier, the label, founded by Jack Dunning, who is better known as producer Untold, quickly set out sharing killer records from the likes of James Blake, Pearson Sound - then known as Ramadanman - and Untold himself in its fledgling years. It was James Blake’s debut release, Air & Lack Thereof, in 2009 that first fully introduced Londoner Dwayne Parris, today producing and DJing simply as Parris, to the label. He had come across the record and label, like many at the time, as a dubstep obsessive who had begun regularly attending storied club night FWD>> that same year while it still took place at the now-closed and widely hailed Plastic People. 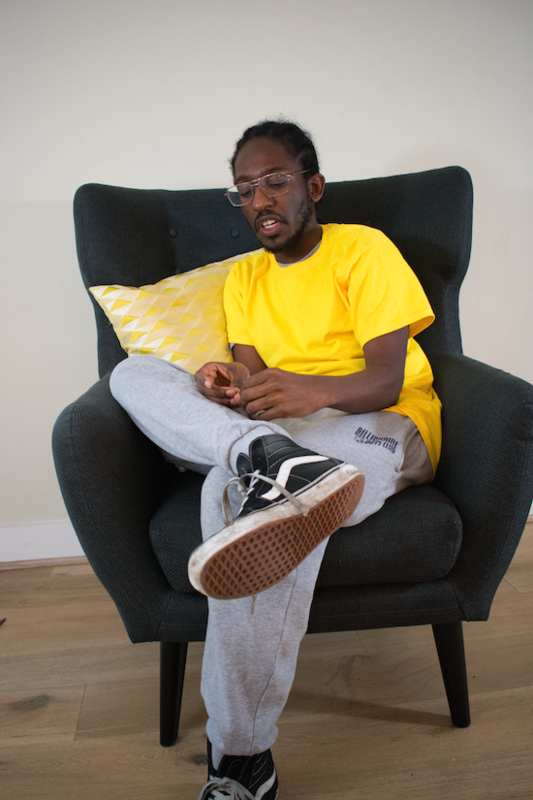 Fast forward eight years, following a handful of early releases and a lengthy run spent working behind the scenes of London’s underground dance music scene, and Parris is now on the cusp of putting out a record with a label that is heavily intertwined with his own discovery of the kind of music he makes today. His enthusiasm is unmistakable as he tells me of his excitement at soon seeing the finished copies of the record, only his third solo release. That record, Your Kiss Is Sour, sits at the more abstract end of Hemlock’s output to date, its three tracks teetering somewhere between oddball experimentalism and functional club weapon. Parris is a producer fascinated by low end bass frequencies, tracing back to the dubstep he was a firm follower of a decade ago, and while his Hemlock debut refuses to adhere to many of today’s conventional club expectations, it’s decidedly geared towards weighty sound systems. Connecting over Skype a little over a month ahead of the record's release, we discussed the expectations often placed on club-focused music, formative nights spent at FWD>> and why Your Kiss Is Sour is the first record of his that he feels completely happy with. Would you say that there’s a specific theme that ties the new record’s three tracks together? Parris: I guess it expresses my minimal approach to producing music, and in a much more extreme way than I have in the past couple of years. I don’t think there’s an overarching theme because I’d finished the tracks separately and sent them over to Jack [Dunning, Untold], and he decided they would make a great EP. Obviously because he’s been running Hemlock for such a long time, I trust his ear for that. With the record coming out on Hemlock, it’s obviously up there with labels like Hessle Audio and Livity Sound as one of the most prominent and essential UK labels for bass-driven music, so did signing a record to Hemlock feel like a big achievement for you? P: It’s still sinking in in the sense that I’m waiting to see the record, and then it will feel real. I’ve been collecting Hemlock records since around 2010 and I think the record that really introduced me to the label was James Blake’s Air & Lack Thereof, and from there I checked out the older records, and then closely followed every release since then. I started getting into a lot of dubstep around 2007/08, so from that I really developed my music taste and learnt about more on that whole side of the genre. Hemlock was the first label I got into after that on that whole Hessle Audio axis moving away from dubstep, and the music on the label felt very different and unique in its sound. Obviously the three tracks on this record are designed to be heard on quite punchy sound systems with the bass frequencies forming a key element, but they wouldn’t perhaps figure into traditional peak-time club scenarios. Do you take more pleasure in making music that sits outside of that traditionalism? P: Since I’ve been listening to so much UK-based electronic music over the last 10 years, I think I’ve always tried to do something that sounds a little different and ask myself if what I’m working on sounds like this or that. I guess, as a result of that, I’ve ended up stripping back a lot where it perhaps takes cues from some of that music that has influenced me, while also keeping it quite far removed from everything else so that it doesn’t sit so comfortably into traditions. Bass is really important to what I do. I used to go to [London club night] FWD>> quite religiously for two to three years about seven or eight years ago, and listening to such bass-heavy music on the Funktion-One sound system they would have in the club definitely had an influence on how music affected me and how I produce it. There is a part of me that would maybe want to make something a little more functional in a club setting, but I haven’t quite found what works for me yet, whereas what I’m working on right now does work for me. Parris - Your Kiss is Sour from Hemlock Recordings on Vimeo. Do you feel like your sound has particularly progressed since your first experiments with production and when did you first start producing? Is minimalism quite an important production technique for you? P: I think that’s mostly down to the roots of the music I like and of getting into club music via dubstep. I’m heavily influenced by a lot of early DMZ and Tempa records and I guess that’s quite obvious from listening to my music. A lot of those records were quite minimal and centred on being played through sound systems to appreciate the bass weight and the low end frequencies. I don’t want to clutter my music because I want every element to properly shine through, so if I’m adding sounds I want them to all make complete sense in the context of what I’m doing. The minimalism is mostly just about taking an interesting set of sounds and making them work in a cohesive way. I scrap a lot of ideas. I start a lot of music, but the amount of ideas I start and the amount I actually finish is very different. I only actually finished four tunes last year and even the year before it was around the same number. When I write something, nine times out of ten, it will generally come together in a day, but then there will be loads of time wasted on ideas that don’t work. Does that get frustrating at all? P: Sometimes it does, but I’m getting to a point now where I feel a little more confident about my ability and what I want to achieve, which means I’m starting less ideas which end up being scrapped. I take my time a little more in starting out and working out what I want to do so I just have a better focus, and that’s down to just feeling more like I know what I’m doing with my set-up. You mentioned FWD>> just a short while ago. When did you start going there? P: The first FWD>> I went to must have been in late 2009 or early 2010. The first person I watched was Chef but I can’t remember who else was on the line-up that night. I guess there was still a pretty solid dubstep presence at the night at that point then? P: That was when Hessle Audio and Swamp 81 were really picking up pace, and Loefah was fully moving away from dubstep, so a lot of things were changing at that point. I remember watching Loefah there in 2010 and he was playing the Swamp 81 sound, and I was still discovering new things at that point, so I went expecting to hear dubstep. I actually didn’t get that slower move away from dubstep at that time and it took the next six months to a year to start really getting a taste for it. It’s interesting because I was watching a sound develop into something else without fully realising it, like the people going to the night and first hearing dubstep five or six years before me. Are there records or specific club experiences from that time that were really formative on your production when starting out and up until now? P: I would actually say a lot of the early James Blake records definitely felt very unique to me as an overall sound palette at the time that they were released. They showed the level of experimentation that this style of UK music could do while still remaining quite functional. A lot of Beneath’s early mixes were really special for me too. He did this mix for the Electronic Explorations series in 2012 or 2013 and that really stayed with me. I think it’s the same with Beneath as a producer because he’s always carried this specific vibe and been on his own axis; I’ve always thought he’s quite an underrated producer. His sound has developed really nicely over the years and that’s great to see going from being a fan of his to knowing him personally. I’ve always placed his music very highly. Also a lot of the Hessle releases around that 2011-12 mark where you just think ‘what is this?’ It wasn’t trying to be part of anything, and that reminds me of a very interesting conversation I had with [UK Garage DJ] Spoony at Rinse FM once when he asked me what I produce, and I didn’t really know what to say. I think I said the only way I can describe it is that it takes in a little of everything without being anything, and I guess he was just baffled by what I was saying, but I didn’t really know what else to say at that time. Did you see yourself as more of a DJ than a producer when you were working at [London record shop] BM Soho in 2011 and 2012? P: I always considered myself as a DJ first. I was still cutting dubs at this time and DJing was what I was trying to make a name from at that point. Producing was quite weird for me because some of my very early experiments with it were starting to get played by a few people and I felt like I was operating in this place where a lot of people around me were more developed in terms of understanding what they were doing and how to do it. I’m quite thankful that my really early records didn’t get too much attention at the time because it gave me more time just to develop and find myself, and feel more comfortable. Just something as simple as buying a new computer last year to work on was a big help, because it meant I no longer had to struggle as much as I was before to work on music, and could get myself into a good headspace because of that. You never know how much you’re struggling with music production until you get something new in your setup, and then you just wonder how you were even managing to produce things before. There are points, as things progress, where you feel like maybe you should add something to your set-up and buy this or that, but it can be unnecessary, because if something’s already working for you, it’s good to stick at that and continue until you feel completely comfortable. If I’m not comfortable with what I’m doing then there’s no point in going out and buying extra gear because it’s only going to complicate things more. Talking about bass music frequencies again, there’s obviously a strong lineage of that in Bristol in terms of dubstep and the more UK techno sounds emerging from there now with labels like Timedance and Livity Sound, and there seems to be some parallels between all of that and the sounds in your music too. Has that community been particularly influential to your recent development as a producer? P: Well, funnily enough, I moved to Bristol around a month ago, so I’m here now. I feel like the scene has maybe been more welcoming or receiving. The first time I came to Bristol was to drop some records off to Idle Hands so that I could get them selling the releases on my label [Soundman Chronicles]. I wanted to go there on face value and say ‘here’s a record, would you be interested in stocking it?’ So I went there and spoke to Chris [Farrell, who runs Idle Hands record shop and label] and he took some copies of the record, and he’s always taken them since. He was the person that put out my first solo release too, so he’s always been a huge supporter of my music. He got behind me when I had barely anything to my name, after hearing something of mine played by Kowton on NTS. That’s how my first record came about on Idle Hands, and just thinking about it now, he’s been constantly supporting me for nearly five years. He does that with a lot of people too, supporting new artists and labels and really getting behind them. Since being here, I’ve actually made a lot more music than I had at this point last year. There’s something about London that just feels a little colder in how the music scene works because of how big it is. Everyone’s doing their own thing but so supportive of everything and everyone else in Bristol. I’ve always been a bit way of the idea of ‘scenes’ because you’ll see people talking about these trends and some people might get massive from it while other people end up falling off or you just stay in the same monotone place. I’ve never really been interested in defining things as ‘scenes’ because you can have a place where you feel sonically similar to other people without having to fall into a scene.